This cylinder and piston kit for S&S 95" big bore kits may be used to replace the stock cylinders, when building a 95" big bore engine. Also handy for repair of an existing 95" engine. Cylinders are finished with a durable wrinkle black powder coat that matches the stock engine finish. 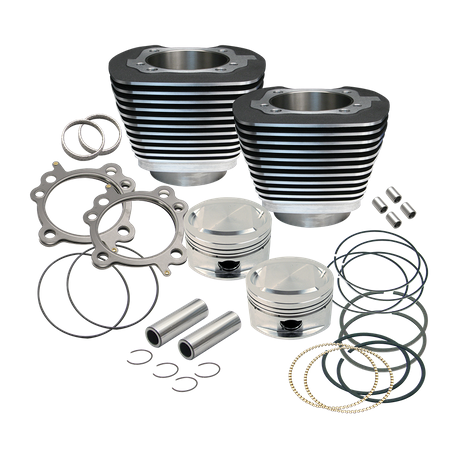 Kit includes S&S 3-7/8" bore cylinders and forged stroker pistons for stock 4" stroke flywheels, rings, wrist pins, and head and base gaskets. For best performance, appropriate camshafts, performance air cleaner, performance exhaust and fuel system tuning are required. EFI engines will require tuning. S&S recommends Dynojet® Power Vision® flash tuners for 2001-'06 engines with Delphi® EFI systems. Not legal for sale or use on CA or EPA pollution controlled motorcycles.